Did you know that the British classic Shepherd Pie is traditionally made with lamb or minced beef? The recipe that we are sharing with you today, is a twist to the original Shepherd Pie. 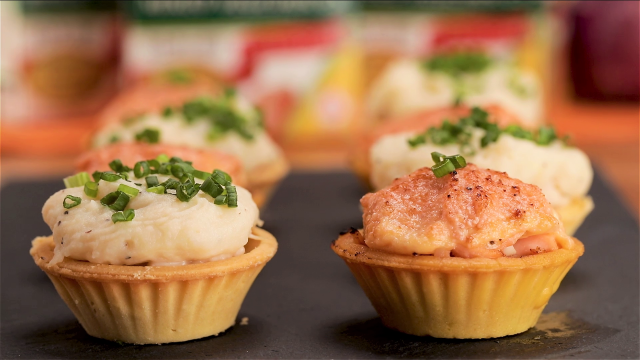 We have transformed it into a tartlet form and the crispy tartlet paired with the savoury fillings is a match-made in heaven. Especially for those mentaiko lovers out there, this will definitely blow your mind away! 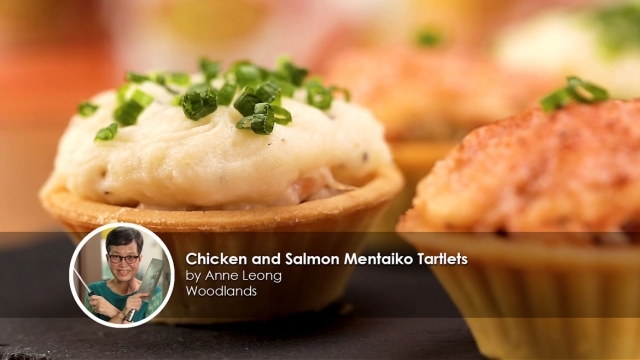 Learn this recipe shared by Home Cook, Anne Leong. 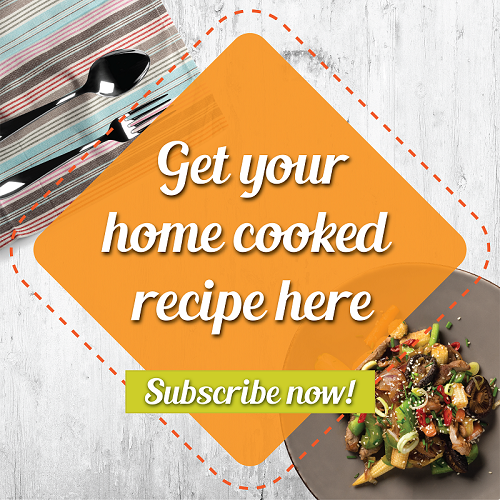 She’s a creative veteran Home Cook who loves to come out with healthy and tasty home coked recipes! The recipe that we are sharing with you today, is a twist to the original Shepherd Pie. This will definitely blow your mind away! 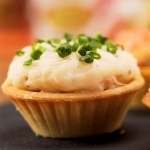 These are the ingredients that you’ll need: ready-made savoury tartlet shells as the base, fish roe, Japanese mayonnaise and spring onion as toppings. 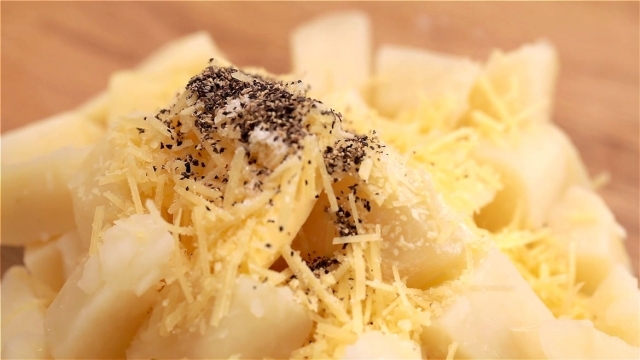 For the mashed potato, you’ll need: russet potatoes, salted butter, black pepper and salt, cooking cream and Parmesan cheese. For the chicken filling, you’ll need: minced chicken meat, bacon, button mushrooms, Del Monte mixed vegetable, chicken stock, salted butter, yellow onion, garlic, plain flour and cooking cream. For the salmon filling, all you need is salmon fillet, salted butter, bacon, button mushrooms, Del Monte mixed vegetable, yellow onion and garlic. Now, let’s get on to the recipe! To prepare the mashed potato, de-skin the potato and cut into cubes. Boil them in a pot of water until it is soft. Drain the water and place it in a mixing bowl. Proceed to add in all the ingredients and seasoning, mash it with a fork until you achieve a smooth consistency. Add in more seasoning as desire. Once it is cooled, transfer to a piping bag. It’s time to cook the chicken filling! In a frying pan, add in butter, onion and garlic and stir fry till fragrant before pouring in the chicken stock and plain flour. Stir until the mixture thickens and no more visible flour lumps. Add in the rest of the ingredients and cook until all the ingredients are cooked through. Adjust to taste and set aside. Remember to break the salmon apart and cook until all the ingredients are cooked through. 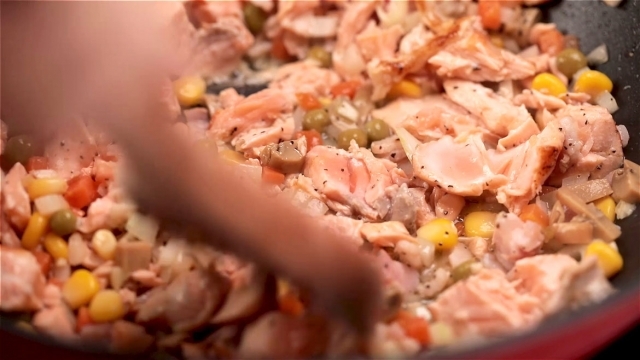 Lastly, for the salmon filling, add in butter and salmon into a frying pan and sauté until ½ cooked. Add in the Del Monte mixed vegetables and the rest of the ingredients. Remember to break the salmon apart and cook until all the ingredients are cooked through. Adjust to taste and set aside. There are no artificial colouring not preservatives and is is a versatile ingredient that blends perfectly well with any type of meat! 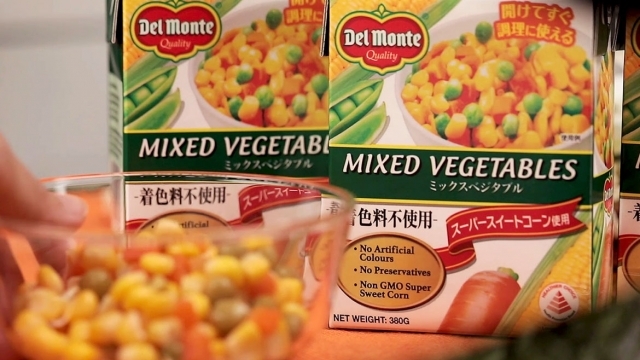 Did you know that Del Monte mixed vegetables has no artificial colouring nor preservatives? It is a versatile ingredient that blends perfectly well with any type of meat, it helps to balance the palette with the rich flavor, making the dish more delightful! For people who are looking for a healthier option, this is a perfect substitute to frozen mixed vegetables. No changes are required in your original recipe. This is definitely a hassle-free substitution. Time for the exciting part! Scoop the fillings into the tartlet shells. Pipe the mashed potato into the creamy chicken filling and rain it with chopped spring onion. 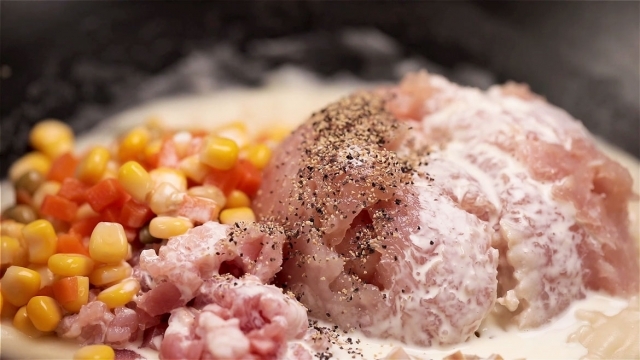 Mix the fish roe and mayonnaise into a bowl and spread it on the salmon fillings, torch it! Torching is optional but it’s really fun and it enhances the tart with a tad of char taste. These tartlets look so adorable. Filled with flavours that burst in your mouth, they are perfect for any gatherings! This mini appetizer is a great way to kick start the party. Learn this recipe today!